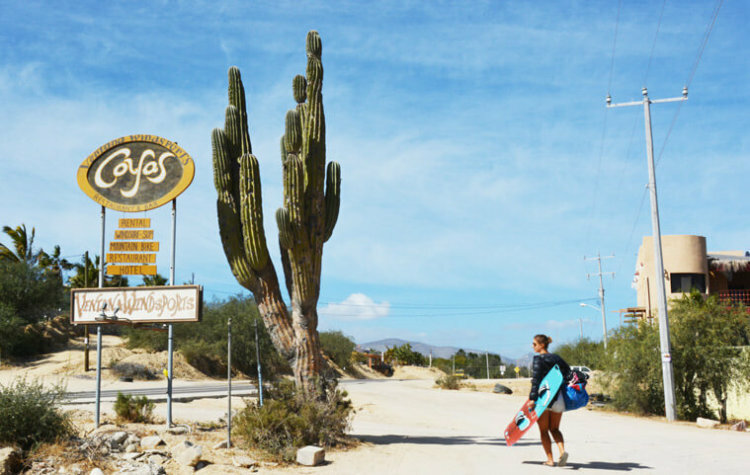 I had no idea what to expect from La Ventana and I had heard anything from “it’s in the desert in the middle of nowhere” up to “it’s like Cabarete and Tarifa but in Mexico”. After not finding too much about it on the web, I was more than curious. And it blew my mind, once again. 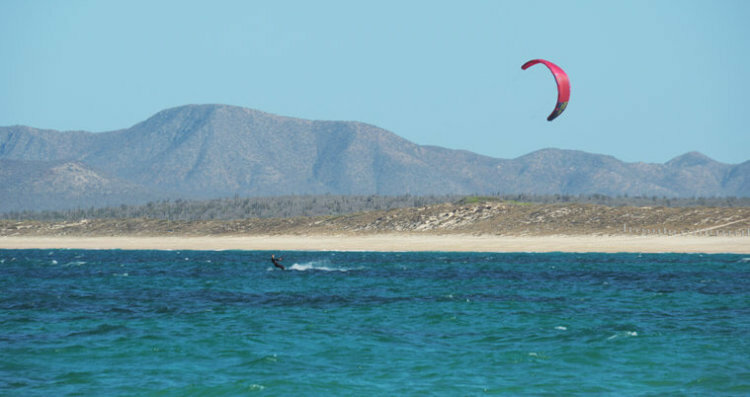 That little Mexican town, which actually stretches from El Sargento to La Ventana, is one huge kiting bay. 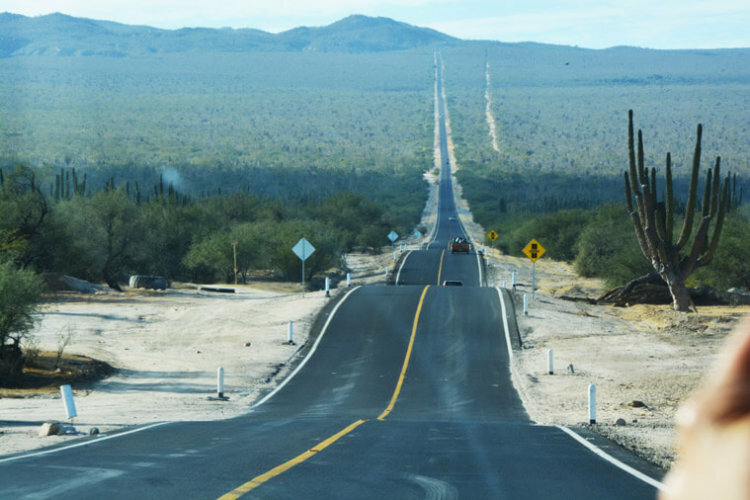 It has a pretty unique natural surrounding: cactus forests, desert landscapes, bright beaches, deep blue and turquoise clear water and the beautiful contrasting mountain chain which gifts La Ventana with an extra wind boost. The best wind is from November until March although the season generally goes from Mid-October until April/May. For the kite sizes you’ll probably need anything from 7 until 16 – I had a 7, 9 and 12 with me and used them all. In November/December as well as April/May you might still get away with a shorty. You’ll definitely need a long wetsuit from mid-December until March, I wore a 4/3 in February. While it’s quite warm during the day and in the sunshine, it gets more cold at night so make sure to bring some warm sweaters. You’ll find choppy water, with stronger wind you can get some nice little wind waves close to shore. If you can find a flight, the quickest way to get to La Ventana is flying in to La Paz (LAP). It’s not always easy finding flights to La Paz so you must be pretty lucky. From there it’s a 1-hour-ride with rental car. You can find cheaper flights to Los Cabos (SJD) and drive from there in like 2.5 hours to La Ventana. 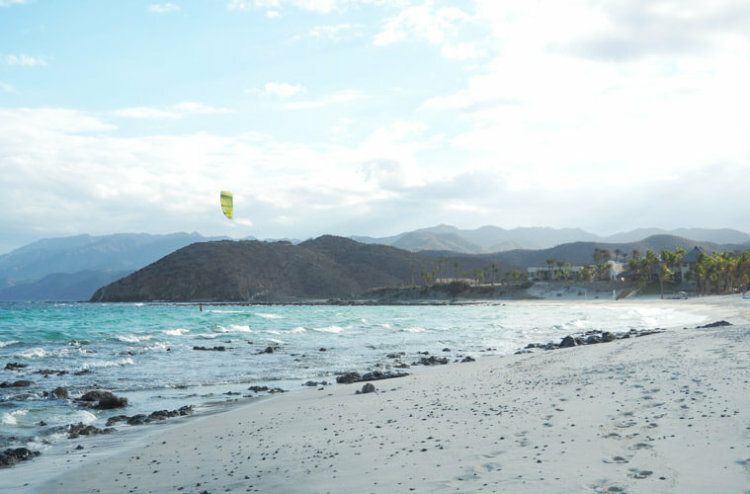 If you don’t have your own car you can either ask around in the La Ventana kiteboarding group if someone is heading up from Los Cabos to La Ventana or if not, they’ll recommend a driver. If you’re on a tight budget and live in Southern California, you might as well take a bus/train to San Diego, from there an Uber to the border and cross the bridge to Tijuana by foot. Flights from Tijuana (TIJ) can be much cheaper than from L.A. or San Diego. 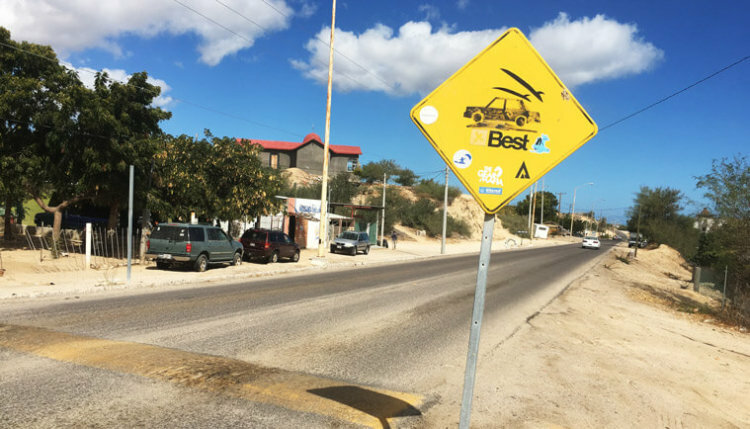 While I was in La Ventana I often saw posts in the La Ventana kiteboarding group from people who still had a spot in their car left, driving down from California or back up. So if you’re up for a little adventure, keep your eyes open! We found a wonderful airbnb apartment in El Sargento, which is one village further up from La Ventana so we had a rental car to drive around. 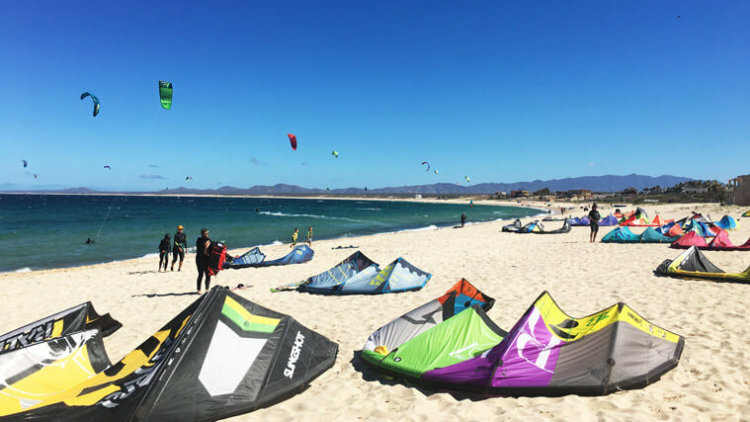 You could also easily kite in El Sargento since it’s once big bay from El Sargento down to La Ventana but we enjoyed the atmosphere (and the yummy cappuccino with soothed our coffee addiction) in Baja Joe. 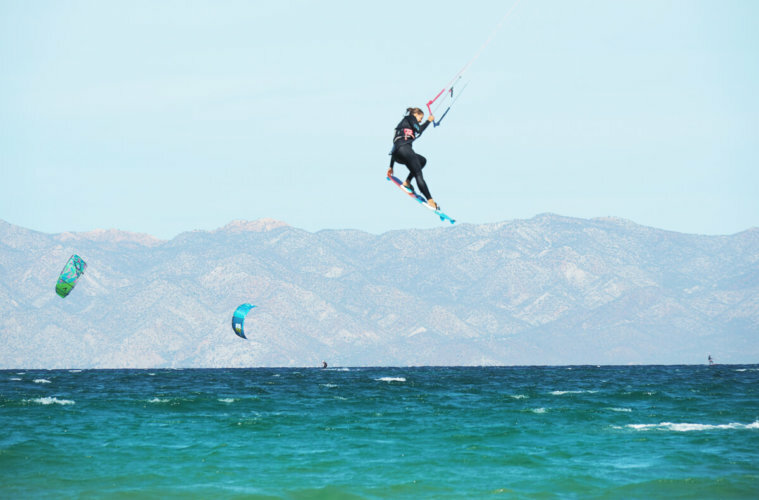 You can always see kiters who downwind from El Sargento to La Ventana and hitch a ride back from La Ventana to El Sargento in the early evening. Or you simply rent a bike to get around, the distance is not really big and it all seem like one big village anyway. Even if you’d walk, it would only be like 30 to 40 minutes from El Sargento to La Ventana. The bright beach, turquoise water combined with the dark mountain range far out is one of the most beautiful views I’ve had on a kitespot, which is why I fell in love with it when I stood there for the first time. The bay is huge so it’s safe for beginners because it will always blow you back to shore (if the wind is sideshore like it usually is on a normal windy day). On a regular day the wind will start inbetween 11.30 and 12.30 and will end around 5.30. The wind can be lighter with 15 knots or pick up when a north cold front arrives and gift you with 30 knots. The wind is always a few knots stronger than predicted in the forecast when the Thermals kick in and there are no clouds. On a day where 7 knots were predicted it was blowing 14 knots so you might be lucky even when the forecast is bad. Just make sure to check that the wind has the correct direction (N or NW) and you’ll probably have an awesome day on the water. The most accurate resource to check the wind forecasts for La Ventana is ikitesurf. Should I go to El Sargento or La Ventana? As I mentioned above, it doesn’t make such a big difference whether you’re kiting in El Sargento or La Ventana. The spots are equally good although it can get a bit more crowded down in La Ventana, if you go in right at Casa Verde, Playa Central or Baja Joe. Which makes sense since those are the kite schools and spots where most people enter. You can find a lot of Americans and Canadians which stay for the winter at the spot, a lot of them camp or drive down in their own RV and stay at the campground. That’s why the atmosphere at the spot is super open-minded, it’s easy-going for a solo traveler to chat to people at the spot and make new kite friends. It depends a bit on your budget. 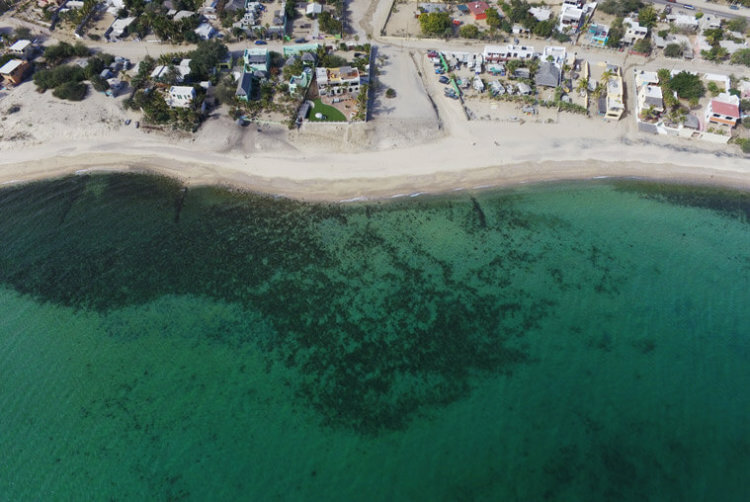 You could either stay at the campground in El Sargento or La Ventana which are both close to the ocean so you’re right at the spot. We rented an apartment via airbnb, which was way cheaper than renting a regular hotel room. There are quite a lot of offers around on airbnb and it seemed to be a bit cheaper in El Sargento. If you’re just there for a short stay and have a normal budget (so don’t need to choose a cheaper option) it makes sense to stay right at the spot, e.g. 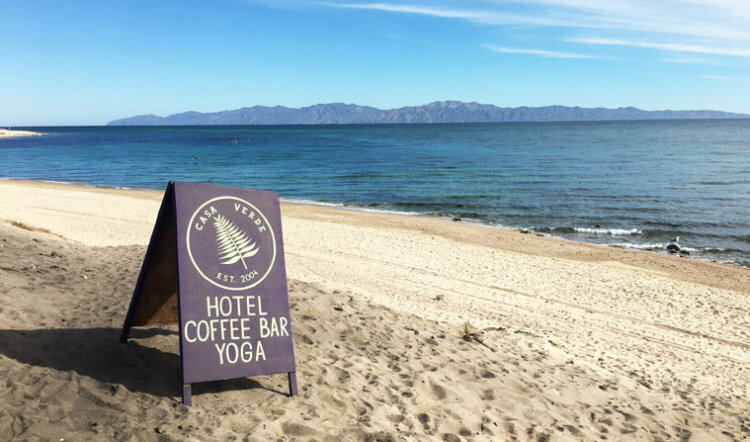 in Baja Joe or Casa Verde – which both have beautiful yoga spaces and yummy coffee. Another beautiful hotel that was just built and has the most amazing restaurant is Casa Tara. Mariscos El Cone: My favorite seafood in El Sargento! I don’t know whether to recommend you the Shrimps with Garlic, the Ceviche, Sashimi or just all of them. The Guacamole is huge, super yummy as well and all of it at reasonable prices. Casa Tara – La Moringa: Incredibly yummy health food with lots of options (e.g. even gluten-free pasta and guilt-free desserts like the raw chocolate cake or key lime cheese cake). I can recommend everything but the salads were my favorite as well as the fish with the roasted cauliflower puree. Make a reservation because the place might be packed at night. Whatever you choose, make sure to take the cauliflower puree as a side dish just to try it (if it’s not in your dish included anyway). The Taco place (don’t remember it’s name): There is also a simple but yummy Taco place which looks just like a hole in a wall and is super crowded at night, it’s when you’re going from Baja Joe in the direction to La Ventana on the left side of the street. You’ll see it, it’s always packed. Baja Craft Coffee roasters: (6:45 – 2pm) My favorite coffee place, just for the variety of sweet treats and the view. They serve coffee with normal milk (soy, almond or coconut milk for the vegans) and have lots of good cakes (the cheesecake was super yummy)! It closes at 2pm. 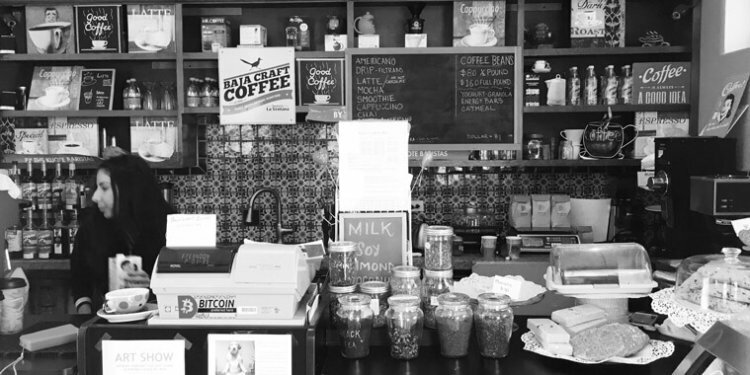 Baja Joe: (7am – 12pm, 4 – 6pm) Yummy coffee and sweets. If you’re wondering why it’s closed from 12 until 4: the owners obviously love to kite as well ? La Ventana and El Sargento have a few supermarkets which are quite well equipped –including stuff like almond milk, nutella and balsamic vinegar which we sometimes couldn’t even find in the big supermarkets in La Paz or Los Cabos. A must-see and must-go! 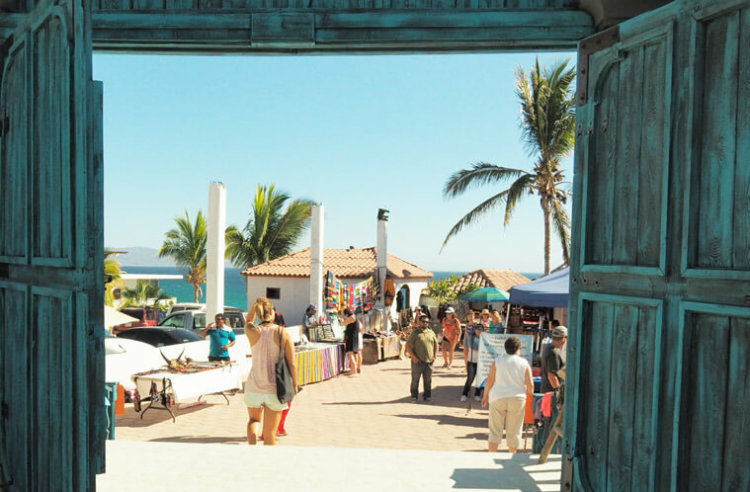 Every Thursday at La Ventana Grande – the entrance is at the turquoise wall, you can’t miss it. If you want to buy veggies make sure to come early, otherwise it’s open until early afternoon. It has all kinds of international and local foods and treats, yummy foods, homemade soaps and sometime jewelry. We always bought gluten-free paleo bread, the thin and crispy sun-dried tomatoes, hummus and almond butter there. From 7.30/8am – afternoon although some vendors already leave around midday. 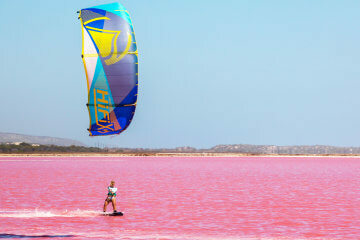 Make sure to join the Facebook community La Ventana kiteboarding since all events, parties, ride shares etc. are posted there. Also check the black board at Baja Joe and the wall of the yellow supermarket next to Plaza del Teso, since some events are displayed there as well. As a yoga addict La Ventana had a surprisingly great and high-quality offer of yoga classes! Holistic Health event on Sunday at La Ventana Grande (same location as farmers market). 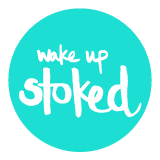 Get a chiropractic treatment, thai massage, reiki or go to a yoga class (from 8am – 3pm). 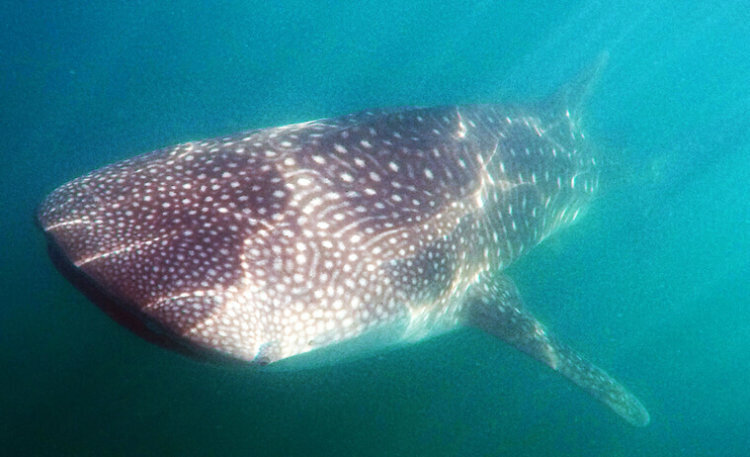 (1 hour drive) Drive to La Paz and go swimming with the whale sharks. You could also easily do it in the morning and be back by lunch when the wind starts to pick up. Or take a stroll through the port and marina afterwards and shop some grocery in one of the big supermarkets in La Paz. (30 min. drive) Just chill at a beautiful beach and have some good food in a nice location: drive up to Bahia de los Suenos and spend a day just relaxing and beaching at the beautiful resort there (you can enter it if you just say you want to go to the restaurant). In the end the wind even picked up (onshore) after all so we had a great kite session all by ourselves. To top it all of, dive over to the lighthouse to watch the sunset. 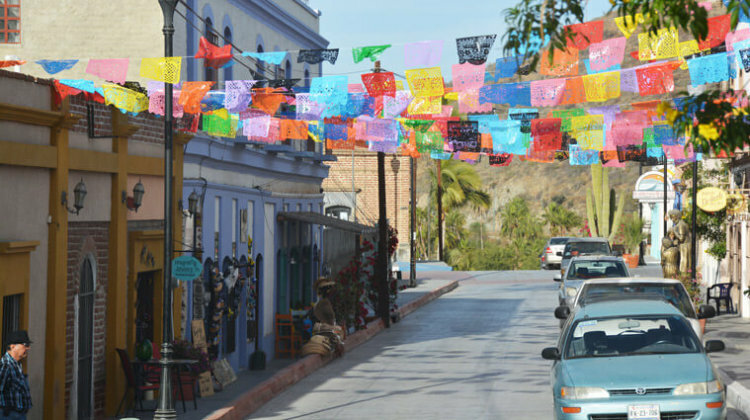 (1.5 hour drive) The Hotel California in Todos Santos. That song by the Eagles accompanied me on endless roadtrips and finally I had a chance to see that hotel that the Eagles sung about. 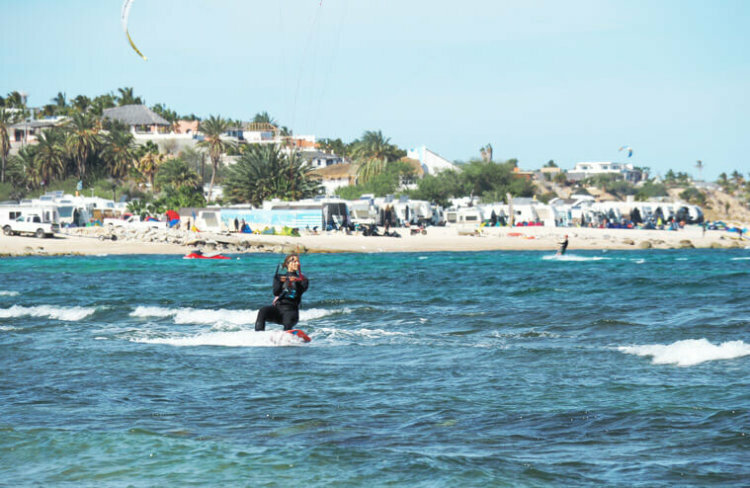 Kiteboard, Windsurf and SUP board races, clinics, downwinders and parties. All with the goal to raise money for the local schools in the area and have a lot of fun while doing that. Since 2014 La Ventana is the home and the 1st stop of the Hydrofoil racing tour. 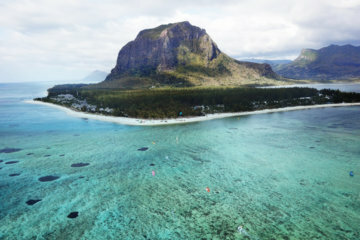 > You’re all giddy with excitement for your next kite trip – but wondering what you’ll need to pack for your adventure? 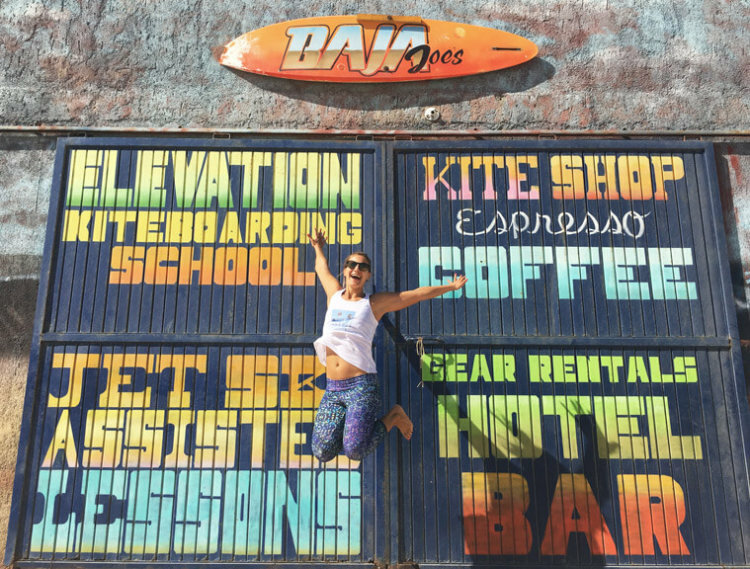 Here is my huge resource list with all the tips, links and apps I use on my kitesurf travels. Also check out this article to get some tips on the best way to pack and travel with kite luggage. Wow!! great article and really complete. It has all the information a traveler needs about La Ventana. Seems you enjoyed the town. very nice blog, but can’t believe that you’d say you always need a wet suit. I’ve kited LV and lived there for 3.5 years year round and never wore a wetsuit once so obviously it’s a preference thing. Miriacoulous!! Take me back right now??! Thank you for gathering all the Information and saving it here! very good article! It looks like you covered everything except the incredible amount of high quality mt bike trails in El Sargento. The group of hard working trail builders deserve some credit for the amazing work that they have done. Once again, nice article! Hi Jim, true I didn’t know much about it to be honest, I just have Mountainbiking in the No Wind Activities without any more detailed info. Is there a website for all the trails? wind. Assuming you can buy equipment there and lessons would be reasonably priced.Thanks again. Kitesurfing is quite different from windsurfing but in my opinion, once you know how to kitesurf, you need way less power than in windsurfing so it’s easier. I would first take classes and see how you like it and once you decided after your beginner’s course you really want to continue, it makes sense to buy equipment. 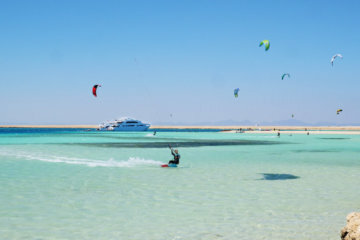 You can also find an article where I’m answering the usual beginner’s questions before starting kitesurfing here. Also am an “old guy” looking for anew challenge – loved wind boarding years ago and now have time/resources to pursue something new. Am in good shape and love water. thank you so much Miriam! this was exactly what I was looking for, having booked my flight to La Paz already. Hi Miriam, thanks for your article and all,this information! We are going to La Ventana in half of February. I have just quick question on you.. Our flytickets allow us to take only two kites – more of them simply do not fit the baggage – because weight. 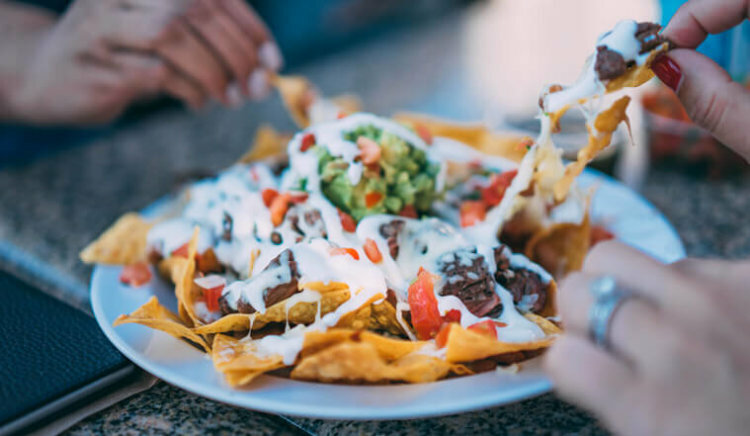 What is the best combination from your point of view and your experience with wind in La Ventana.. My preference is 9 and 11 – but still I hesitate, if not take 13 rarther..? Have fun in La Ventana! I am planning a short solo trip to Ventana to learn to kitboard. I have tried it for 3 days in Vietnam and got close to riding. Since I am going solo I am looking for something more like a hostel where other travelers meet and hang after boarding. Something like the north shore of Maui in the 90’s! Can anyone recommend where to stay to find a little social scene? maybe tradewind kicking in here and there? I’m not the weather expert but just as I wrote it in the article: The wind is always a few knots stronger than predicted in the forecast when the Thermals kick in and there are no clouds. On a day where 7 knots were predicted it was blowing 14 knots so you might be lucky even when the forecast is bad. Just make sure to check that the wind has the correct direction (N or NW) and you’ll probably have an awesome day on the water. Thanks, Miriam, for all the info you provide. 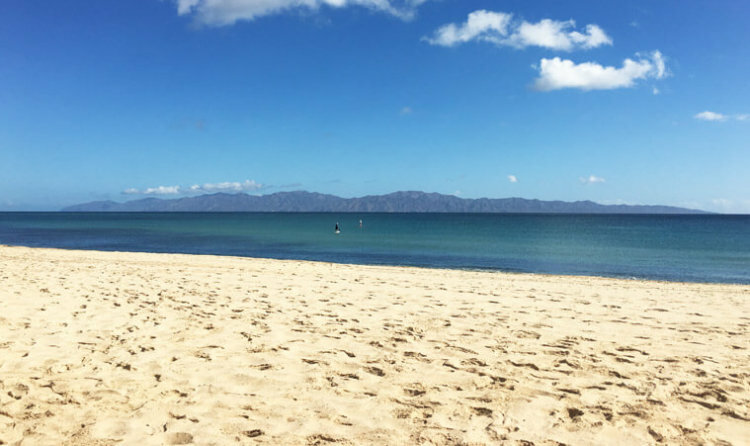 I used your website to prepare for a 30-day stay in La Ventana in November and December 2018. Here I would like to provide another data point of my experience for other readers. 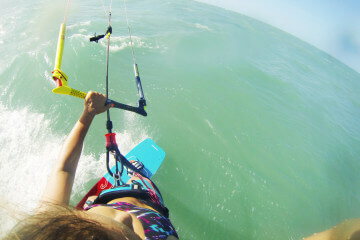 I am a solo female kiter. I weigh 59 kilos / 130 lbs, and I ride a 135 twin tip. So far in La Ventana I have used my 12m kite the most, then the 10m, and occasionally the 8m. I could have left the 6m at home. (All are Slingshot Rallys.) I usually wear my 4/3 full wetsuit, for warmth and sun protection, although sometimes I wear a shorty with a long sleeved rash guard underneath, for sun protection. I read “Mas Viento” for wind info and “The Ventana View” for community info. The best find so far has been “desert sun block,” a long-lasting water-resistant zinc sunscreen made here in Baja and distributed by someone in Boulder, Colorado. (It requires makeup remover at the end of the day.) My lodging is downwind, towards Baja Joe’s. 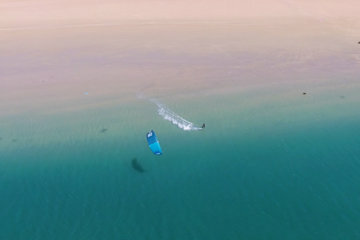 I usually scrounge a ride upwind and then kite home, which is better for me than the alternative, kiting from an upwind spot and then hitching a ride back up north. I have kited 14 out of the past 15 days — paradise!